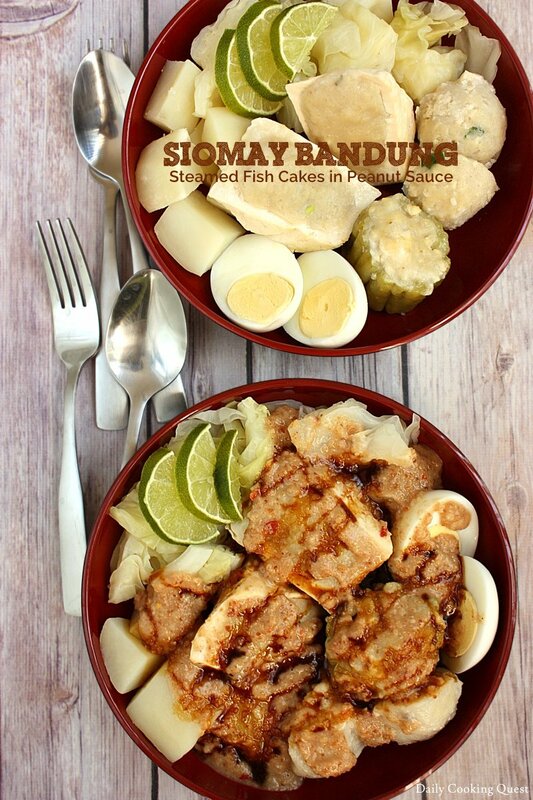 Siomay Bandung is one of my favorite hawker food. I grew up eating loads of this especially during junior and senior high where there was a hawker selling this right in front of the school. When I was really hungry, I would order a plate with everything in it :D Such sweet memories. 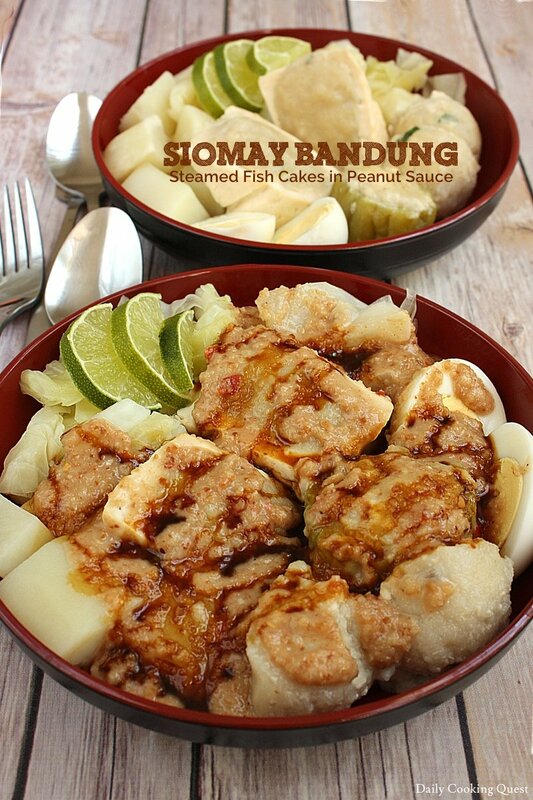 The main star of siomay Bandung is of course the fish cakes, which often are stuffed inside tofu and bitter melon. Some sellers would mound some fish cakes on top of potatoes and have a potato/fish cake combo, though most leave the potato as is. You will also get hard boiled eggs and cabbage in your siomay. 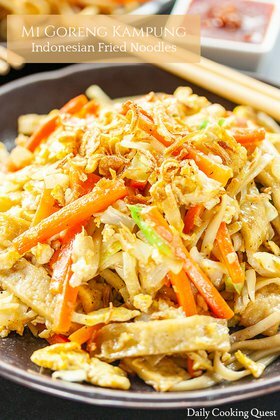 Since this is a hawker food, most sellers will cut the items into smaller bite size pieces before pouring the peanut sauce and drizzle the whole thing with the requisite kecap manis (Indonesian sweet soy sauce). Yum! Pulse mackerel in a food processor, then transfer to a bowl and mix well with the rest of the ingredients. Set aside. Stuff each round of bitter gourd with the fish paste. Scoop out the middle part of tofu and mix this with equal amount of fish paste and re-stuff the mixture back into the hollowed tofu. Steam stuffed bitter gourd and stuffed tofu until a toothpick comes out clean, about 10 minutes. 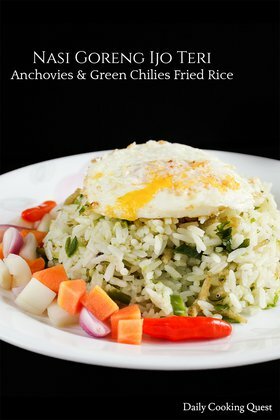 Optional: if you have leftover fish paste, prepare a boiling water in a pot, then drop tablespoonful of fish paste into the boiling water. 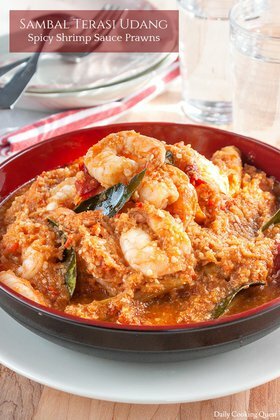 The fish paste is fully cooked when it floats to the surface. Grind the peanut in a food processor. Transfer to a mixing bowl. Heat a skillet and dry frying the garlic and chilies, then grind these in a food processor. Add this to the bowl of peanut. Add sugar and salt into the ground peanut, garlic, and chilies. Mix well. Add just enough water to make a thick paste. 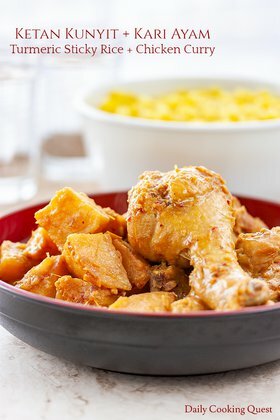 A nice plate of siomay Bandung will include stuffed bitter gourd, stuffed tofu, plain boiled fish paste, some steamed potatoes and cabbages, and one hard boiled egg. Pour about half a cup of peanut sauce onto these tasty morsels, drizzle with the juice of one kaffir lime and sweet soy sauce.